IT HAS NOT BEEN CLEANED, OTHERWISE VERY GOOD CONDITION. Material: Hessian. 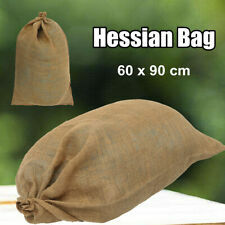 • Large and strong hessian bags. 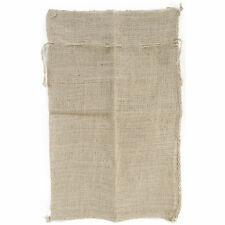 1 x Hessian Bag. • Ideal for use in garden, party sack race, farm storage, flood rescue, and other general storage purpose. Instruction is not included. We found this last batch in the back of one of our barns, still in the original bundle. These were never used. We are now primarily a turf grass farm, which is demonstrated by our new logo which still contains the old "Indian" for nostalgic reasons. Pieces are all different sizes. Total weight is 4 lbs! ONE VINTAGE FEEDSACK GREEN ORANGE FLOWERS MOD FLOWER POWER 37x46 PRISTINE! SIZE: Listed in title, 7 are still in original feedsack form, if stitches removed, would be 37x46. CONDITION: Feedsack has been freshly laundered and lightly pressed. Crisp, fresh, clean! Feedsack is clean and free of tears, spots and odors. Great for any Charm size collector or quilter! This lot feature feedsack prints in shades of turquoise or aqua. Great lot for the quilter! This is a lot of 2 identical feedsack. These are full 45" x 36" pieces. fabric pieces. of usable fabric. but overall in good condition with plenty. including any flaws. I do not know if they were exposed to smoke or pets. 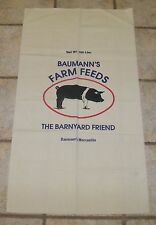 Vintage Feed Quarter Sack Red, Blue, Black Lines Shirting Print 24" x 18"
Stash builders. The fabric has that old cotton feeling--just so sweet. This print has a really colorful and active impression about it. Wonderful addition to a collection or for use in a feed sack quilt project. This type of group will introduce you to the feel and look of how authentic feed sack that has been dyed to these colors looks in your project. Feed sack cotton is bit thicker and more full bodied than the modern cottons. This is a great lot of feedsack scrap pieces. Great for any Charm size collector or quilter! You will find an age spot or two in this entire lot ~ most are perfect. This lot includes florals, solids, and novelty feedsack fabrics. Vintage Feed Flour Quarter Sack Pink Floral with Bows 24" x 18.5"
This print is a really sharp plaid. Very nice paid. Colors are perfect. Stash builder. Cheerful old sack print pattern. The fabric has that old cotton feeling--just so sweet. This print has a really colorful and active impression about it. It is a full 45" x 36" piece. fabric piece. of usable fabric. but overall in good condition with plenty. including any flaws. I do not know if they were exposed to smoke or pets. I do not know the histories of each item. Vintage Feed/Flour Full Sack Orange & Cherry Red Roses w/Coral accents 43" x 37"
Stash builder. The fabric has that old cotton feeling--just so sweet. This print has a really colorful and active impression about it. 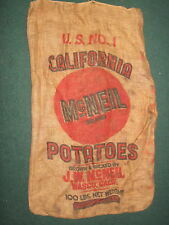 Wonderful addition to a collection or for use in a feed sack quilt project. Vintage Quarter Feed Sack Classic Orange and Yellow Fruit Berries 21" x 18"
This is a classic print from the feed and flour sack era and is often found in authentic feed sack quilts. Stash builder. 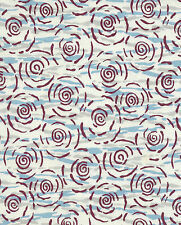 Cheerful old sack print pattern. The fabric has that old cotton feeling--just so sweet. Extra Heavy Flour Sack. Size 16”x13” (10 lb) w/cotton drawstring. (Stuffing & ribbon not included). You can turn them into Country Pillows! Sew them into Runners! Purses, Bags, Seat Cushions, Christmas Tree Skirt! Vtg Feedsack Red polka Dot Blue Aqua Plaid Cotton Fabric Feed Bag 35" x 42"
Intersecting rows of white flowers on blue and aqua with tiny white polka dots on red squares. Full size opened with rough ends. Blue Pink Green Ivory / White - Cotton. THE FEEDSACK FABRIC. 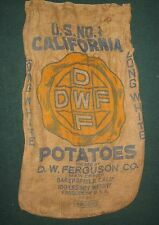 Flour sacks are tighter woven and often lighter weight fabric. A few of the chicken feed sacks are very loosely woven and heavier weight depending on the size of grain that was sold in the sack. Vintage Open Feedsack Feedbag, Dark Blue, Red Green, Flowers. 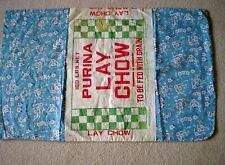 Vintage LARRO DAIRY FEED SACK Fabric General Mills Larrowe Division 39" x 48"
"100 LBS Net Larro Dairy Feed A Milk Producing, Fitting and Freshening Feed. Opened sack is approx 39" x 48". 1 – red flowers with green leaves on yellow background – 38” x 21”. All in good condition. 1 – blue and white flowers with red leaves on white background – 37” x 20”. 1 – floral flowers with yellow background – 38” x 21”. Vintage Feedsack Tiny Flowers Orange Peach Teal 32" X 27" Feed Sack. Condition is Used. Shipped with USPS First Class Package. I have several full and half vintage feedsacks to finish listing over the next couple of days. If there are any holes, tears, stains, etc., I will photograph them. So please look at all photos. Also, I do combine shipping so be sure to check out my other listings. Thanks for looking. Vintage Feedsack X5 Yellow Floral & Tiny Teal Flowers Ribbons. Bows 42" X 36"
Vintage Feedsack X5 Yellow Floral & Tiny Teal Flowers Ribbons Bows 42" X 36". Condition is Used. Shipped with USPS First Class Package. PLEASE NOTE: You will receive 5 sacks of the same print. I have included photos of each. Some do have light soiling, but should wash out just fine. Feedsack holes are present. I have several full and half vintage feedsacks to finish listing over the next couple of days. If there are any holes, tears, stains, etc., I will photograph them. So please look at all photos. Also, I do combine shipping so be sure to check out my other listings. Thanks for looking. This is for a really cute feedsack. Overall it is in really nice condition with no holes or stains that I could find. Which I would say there is a good 2/3's to 3/4's of a feedsack here. This Nice Berries, Grapes, and Apples Feedsack is WONDERFUL! No imperfections noted. It has been washed and ironed, is ready to use and in excellent condition! You will often find tiny stains or small "peck" holes as well as small "pull" holes where the sack was unsewn. Estate sale find. Please look at pictures. This is for an old feedsack, that has been opened up. I have tried to show you these in the pictures. I laid this out on the floor so you could see where this was at. Which there is still a huge amount of good fabric here to use. Colors are Bright - No Stains! It has one hole close to a corner (Photo #4). Sack has been laundered and air-dried. Vintage HIGH SCORE Whitewater Flour Mills, Kansas Cloth Flour Sack Bag NICE! Flour Sack Bags of the Whitewater Flour Mills Co. Whitewater, Kansas in very nice condition. Great for any Charm size collector or quilter! This lot feature feedsack prints in shades of red. Great lot for the quilter! Colors are Bright - No Holes! As seen in the photos, sack has a couple of stains. It has been laundered and air-dried.